Here is a treasure-house of over seven centuries of English poetry, chosen and introduced by Christopher Ricks, whom Auden described as "exactly the kind of critic every poet dreams of finding." The Oxford Book of English Verse, created in 1900 by Arthur Quiller-Couch and selected anew in 1972 by Helen Gardner, has established itself as the foremost anthology of English poetry: ample in span, liberal in the kinds of poetry presented. This completely fresh selection brings in new poems and poets from all ages, and extends the range by another half-century, to include many twentieth-century figures not featured before--among them Philip Larkin and Samuel Beckett, Thom Gunn and Elaine Feinstein--right up to Ted Hughes and Seamus Heaney. Let's get one thing straight. 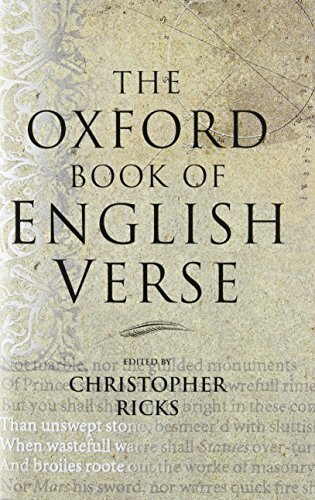 Christopher Ricks's 1999 version of The Oxford Book of English Verse contains some of the finest poetry the world has ever seen. Judiciously selected and beautifully produced, this anthology will reward both poetry virgins and over-versed roués with its canny, sometimes inspired conjoining of the familiar and the obscure. (It's also the first edition to let dramatic verse through the gate, meaning that some of the Bard's greatest lines have now made the cut.) From the medieval "Sumer is icumen in" through Seamus Heaney's "The Pitchfork," Ricks selects 822 poems from more than 200 writers. Not surprisingly, Shakespeare comes out on top. But Wyatt, Sidney, Jonson, Milton, Pope, Blake, Wordsworth, Tennyson, and Hardy also make strong showings, as do such under-anthologized females as Mary Robinson, Jane Taylor, and Frances Cornford. In addition, the editor includes an assortment of mnemonically irresistible nursery rhymes. tried to range over the whole field of English Verse from the beginning, or from the Thirteenth Century to this closing year of the Nineteenth, and to choose the best. Nor have I sought in these Islands only, but wheresoever the Muse has followed the tongue which among living tongues she most delights to honour. To bring home and render so great a spoil compendiously has been my capital difficulty. The metaphors of imperial colonialism spoke confusedly as the Muse followed the English tongue throughout the world and the anthologist brought back the rewards it wrought and wreaked. A century later, the project of "English verse" has lost its imperial certainty, and Ricks is no longer interested in exploiting the former colonies for raw material. Instead, he states categorically that his "does not seek to be a book of Anglophone verse, of verse in the English language whatever its provenance." This leads to some anomalies. He takes American verse only through the 1770s, but is happy to include verse from the Republic of Ireland. As for the linguistic products of the pre-independence Commonwealth: "I judged reluctantly that pre-independence poetry had not achieved poetic independence (freedom from diluted fashion), had not given to the world such poetic accomplishments as would constitute a claim to the pages of an anthology of the best in English poetry." Please discuss!